Dr. Stern was the first historian to listen to and evaluate the then-classified Cuban missile crisis tapes. He is the author of numerous articles and Averting ‘the Final Failure’: John F. Kennedy and the Secret Cuban Missile Crisis Meetings (2003), The Week the World Stood Still: Inside the Secret Cuban Missile Crisis (2005), and The Cuban Missile Crisis in American Memory: Myths vs. Reality (2012), in the Stanford University Press Nuclear Age Series. There was, once upon a time, an extremely popular genre of American biographical literature, going back at least to Parson Weems’s hagiography of George Washington, written with the explicit purpose of inspiring young boys (and only boys) to emulate the example of great leaders and accomplish great things. That genre is now regarded with amused condescension if not contempt and state US history curriculum standards, often echoing the ideology of Howard Zinn, identify few if any praiseworthy individuals in our history—in or out of the presidency. Doris Kearns Goodwin is far too nuanced a historian to be taken in by either of these extremes. 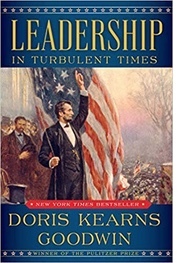 The four presidents explored in Leadership: In Turbulent Times have already been the subjects of Goodwin’s lengthy and extensively documented biographies: Lyndon Johnson and the American Dream(1976), No Ordinary Time: Franklin and Eleanor Roosevelt: the Home Front in World War II(1994—which won the Pulitzer Prize), Team of Rivals: the Political Genius of Abraham Lincoln(2005) and The Bully Pulpit: Theodore Roosevelt, William Howard Taft and the Golden Age of Journalism (2013). Clearly Goodwin’s latest work is different. One prominent historian expressed concern about Goodwin’s use of italicized “self-help bromides,” “bullet-point banalities” and “conference-room poster slogans” typical of the “leadership studies” curriculum in schools of business and public administration—in contrast to the rich narrative histories typical of her earlier, widely-acclaimed biographical work. (There is a 3-page bibliography on “Business Books on Leadership Skills” included after the 13-page historical bibliography.) Likewise, sundry responses on Internet opinion sites have also expressed reservations because Goodwin never explicitly mentions the current political situation and the Trump presidency. This reviewer has known Goodwin since the early 1980s when she was researching The Fitzgeralds and the Kennedys: An American Saga (1987) at the JFK Library in Boston (where I was Historian from 1977 to 2000). She often made herself available to speak to visiting groups about her research and particularly enjoyed dramatically recounting bringing to light previously unknown archival evidence that required completely rethinking a particular event. I was, at that time, listening to the White House missile crisis tape recordings and discovering that Robert Kennedy’s book, 13 Days: A Memoir of the Cuban Missile Crisis, published posthumously in 1969, was an extremely misleading and inaccurate account of those historic meetings. One morning, as Goodwin was about to speak to an Elder hostel group, I chatted with her, in confidence, about my finding; she was fascinated, as a historian naturally would be, and urged me to follow the evidence wherever it led. This personal experience, as well as my own historical instinct, suggest that she chose this time to write a very different type of book—one which steers clear of an explicit critique of the Trump presidency; instead, she opted to analyze several didactic and compelling historical episodes that contrast vividly in both style and substance with Trump’s leadership and which, by comparison, reveal the threat to democratic norms posed by his presidency. Admittedly, there is not a great deal that is new or original in Leadership; the great majority of the historical material is available in countless other secondary works. However, Goodwin’s goal this time is to extract and identify the common chords of leadership that unite the four subjects of her previous work. In doing so, Goodwin, in fact, does not ignore Trump; he is referenced and exposed, though unnamed, by contrasting example on virtually every page of her dissection of democratic leadership. I am convinced that she approached this book as a public historian and educator rather than as a scholar writing primarily for other scholars and even the more discerning history-reading public. In that spirit, she cites Theodore Roosevelt’s conviction that democracy can succeed only when there is “the fellow feeling, mutual respect, the sense of common duties and common interests, which arise when men take the trouble to understand one another, and to associate for a common purpose.” Likewise, Goodwin emphasizes Lincoln’s “emotional intelligence, his empathy, humility, consistency, self-awareness, self-discipline, and generosity of spirit" as well as his "sensitivity, patience, prudence...tenderness and kindness. "“Is leadership possible,” she asks, “without a purpose larger than personal ambition…[and] guided by a sense of moral purpose”?”Lincoln’s leadership, especially “his patient resolve and freedom from vindictiveness,” she insists, is pertinent today, allowing us “to gain a better perspective on the discord of our times.” Goodwin’s historical judgment is all but inescapable despite her decision to only indirectly confront the divisive politics of the Trump era: in temperament and democratic vision and values, Trump is the anti-Lincoln. But there is likely a more subtle formula also at work in this book. Goodwin may be evoking the so-called “improvement” (or “improving”) literature of the 19th century; in fact, Leadership unashamedly aims to inspire, not unlike the hagiographic biographies mentioned above, by examining specific lessons on how these four men exemplified the character and values suited to governing effectively in a democracy. In our nation’s current situation, this book may be far more necessary and valuable for its potential use in our schools and colleges than just one more scholarly presidential study. “It is my hope,” Goodwin asserts, “that these stories of leadership in times of fracture and fear will prove instructive,” especially, from the perspective of this reviewer, for teaching young Americans about the tumultuous story of our democracy and, by counterpoint, exposing the dangers we face today. In 1990, I initiated the American History Project for High School Students at the JFK Library. The program consisted of three in-the-school classroom discussions of the study of history and historical methodology and culminated in a two-hour session at the JFK Library in which the students and teachers analyzed a set of documents about the June 1963 confrontation between the Kennedy administration and Governor George Wallace over the desegregation of the University of Alabama. If Leadership had been available at that time, it would have provided an invaluable addition to the core educational purpose of the project. Of course, before Trump, it is very unlikely that Goodwin would have even considered writing what can be viewed as a 21st century version of a 19th century “improvement” book. *Exhaust all possibility of compromise before imposing unilateral executive power. *Identify the key to success. Our democracy is currently in uncharted political and constitutional waters. Leadership’s didactic topics and subheads could, in what is admittedly a best-case scenario, provide imaginative teachers with a classroom source capable of awakening and nurturing an interest in history in their students. That transformation will require, as Goodwin has done, exposing the chasm between the democratic political leadership of Lincoln, TR, FDR, and LBJ and that of the current President of the United States—with or without mentioning his name.